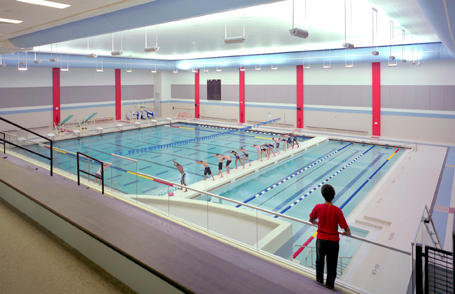 Counsilman-Hunsaker, in association with TMP Associates, was retained by Ann Arbor Public Schools to design an aquatic facility for the new Skyline High School. The goal was to create a comprehensive high school pool, both in terms of curricular and extra-curricular opportunities for students. This proudly marks the third pool that Counsilman-Hunsaker has designed for Ann Arbor Public Schools, nationally recognized for high school swimming and waterpolo. The previously designed Pioneer High School pool (1997) has helped win national swim championships, while Huron High School pool (1996) has helped win numerous waterpolo state titles. Skyline High School expects equally impressive results in breaking records, and has achieved LEED Silver Certification.